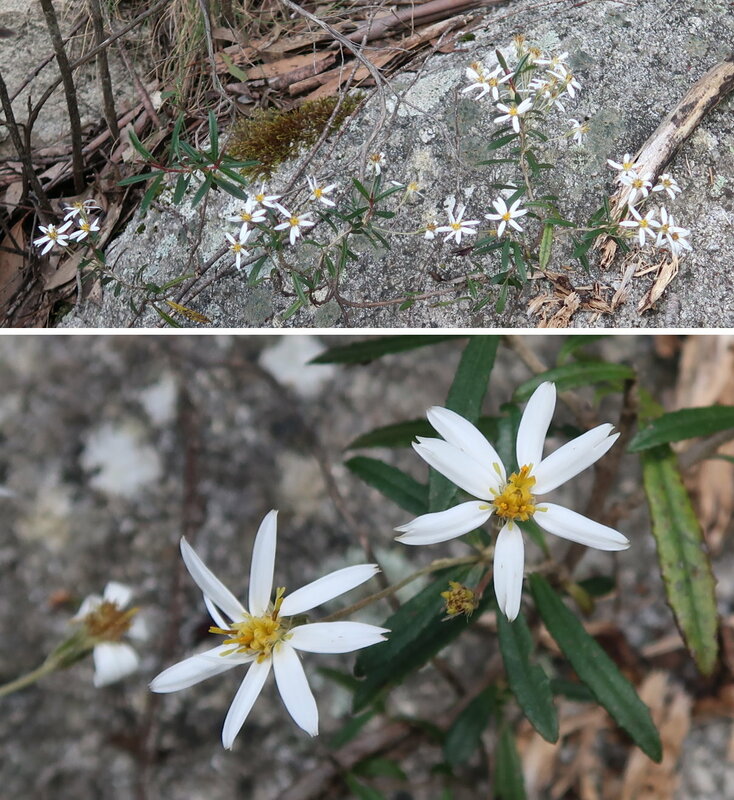 After today's climb to Mt Mavis, I still have Mt Murray and Mt Scabby to tick off. Contact me if you wish to join in to climb these two ... hhmmm ... or any other mountains. • 03 1845 m Mt Murray - Not yet climbed ... Contact me if you wish to join in for the climb. Not yet climbed ... Contact me if you wish to join in for the climb. 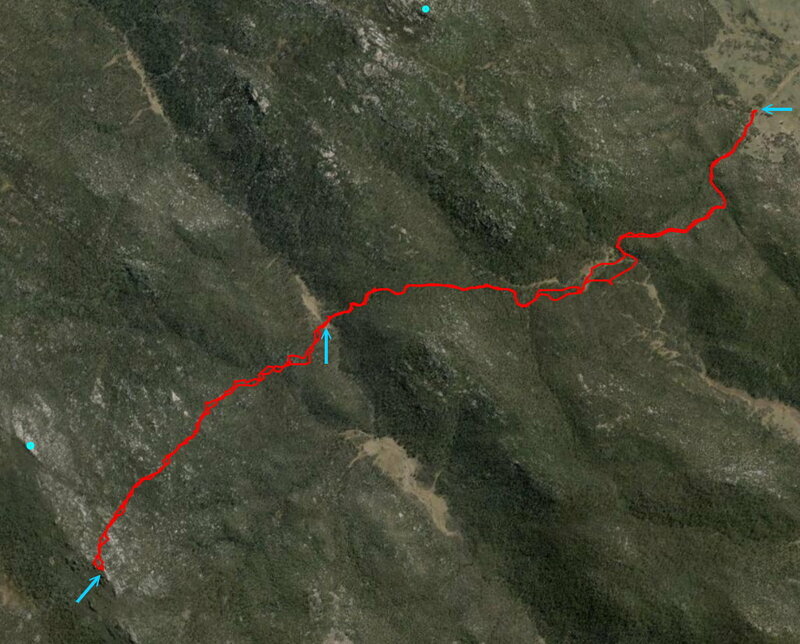 Today's climb, with Neilson, is to Mt Mavis, 1711 meters. In my list above, it is the 13th highest named peak in ACT. 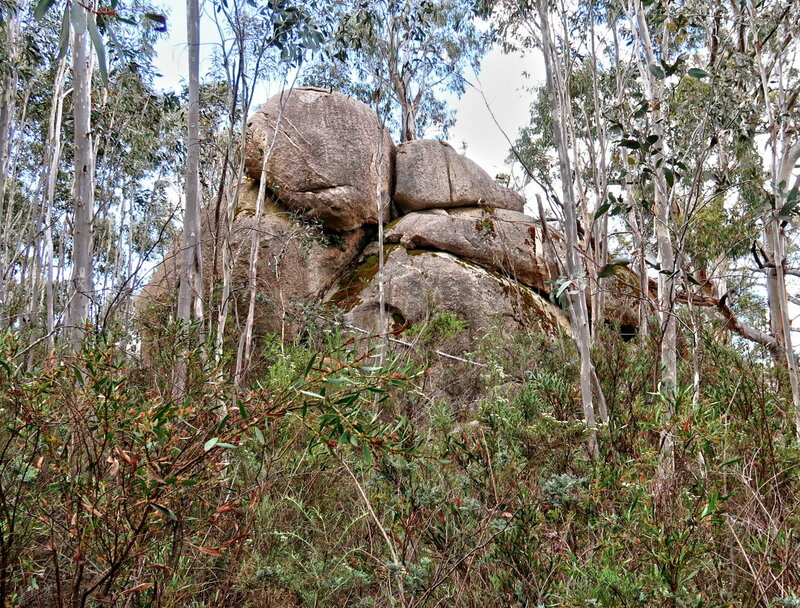 - North-east of Mt Namadgi ... Mt Namadg is its nearest named peak. It took Neilson and I 13 hours for the return trip. We are slow. Fast climbers can complete it in less than 10 hours. - Grey square: Map 5 below zooms into this area. 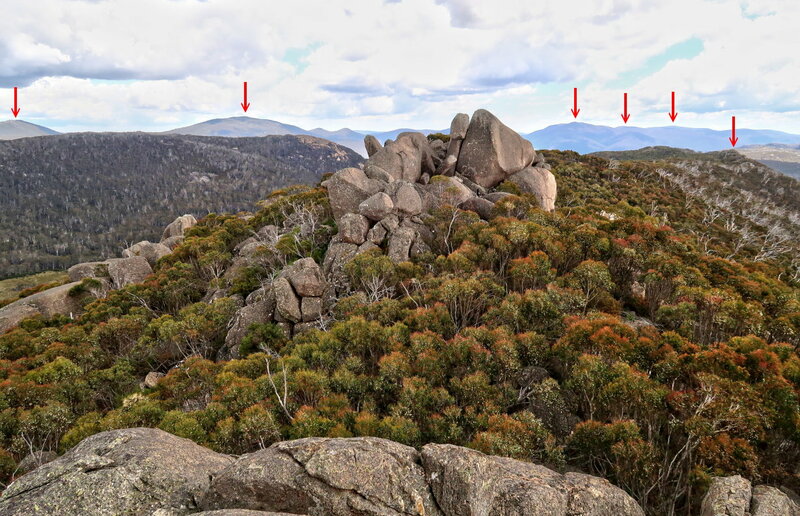 - 2 blue arrows on the right: Forward trip to Mt Mavis ... This part is bushbashing. 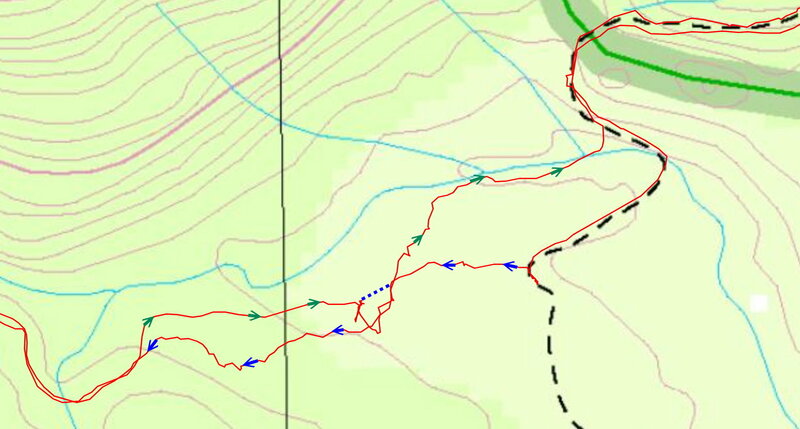 - 3 blue arrows on the left: Forward trip to Mt Mavis ... This part is bushbashing. - 3 green arrows on the right: Return trip to carpark ... Edge of a swampy area along Nursery Creek ... Quite dry and easy to walk on when we are there. 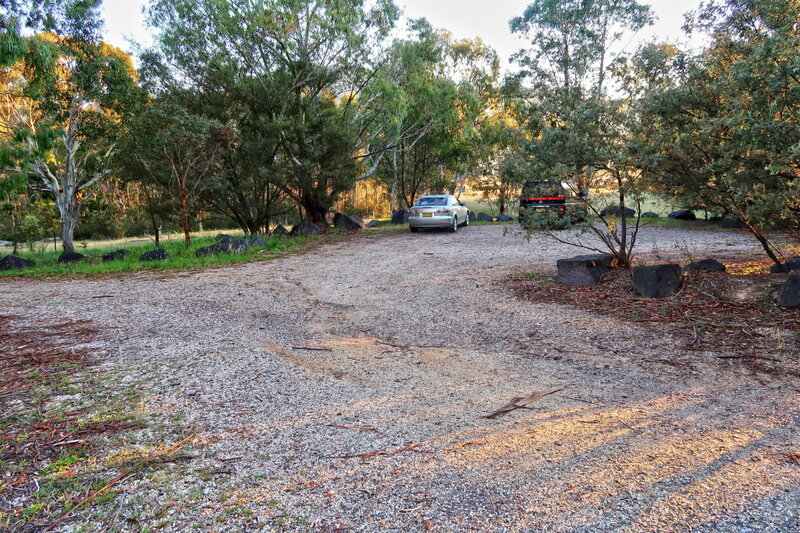 - Start at Nursery Swamp Carpark. 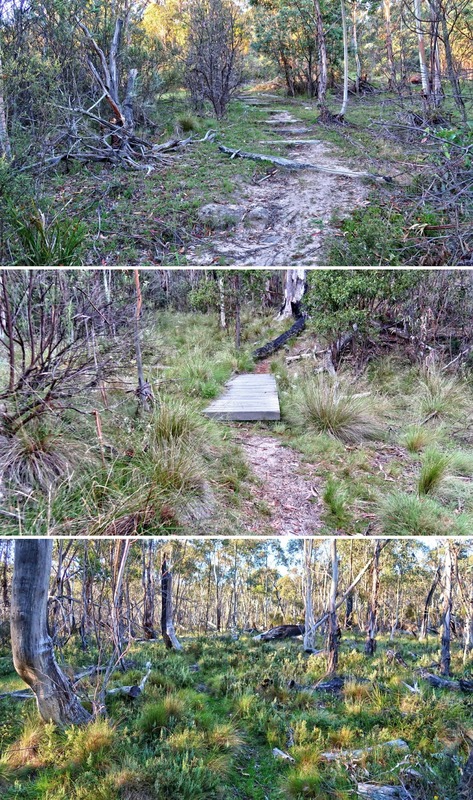 - Walk on Nursery Swamp Walking Track. 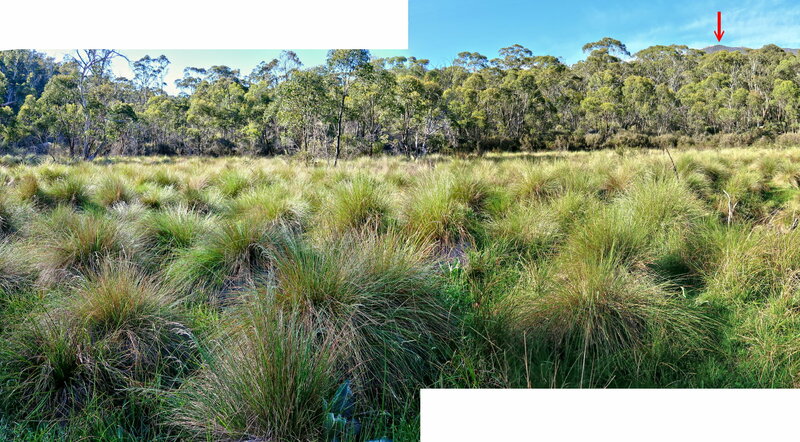 - After 2.5 km, turn west (get off Nursery Swamp Walking Track), and walk towards Rendezvous Creek. 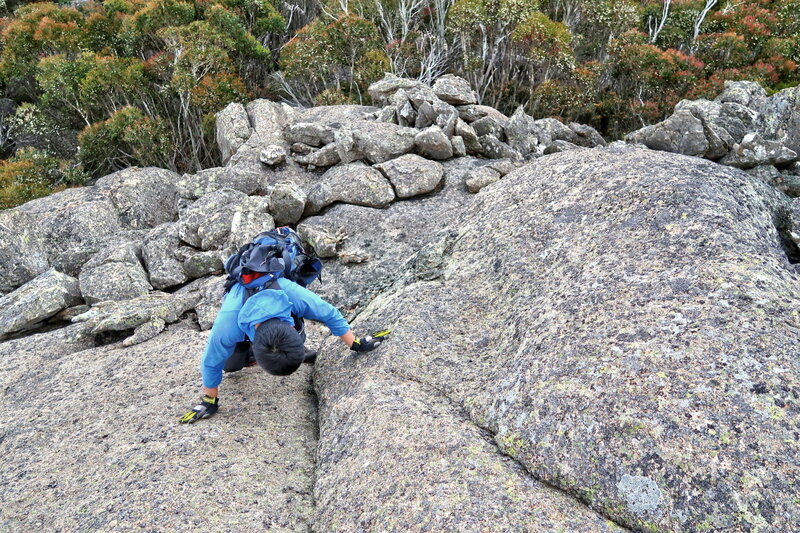 - Climb towards Mt Mavis. 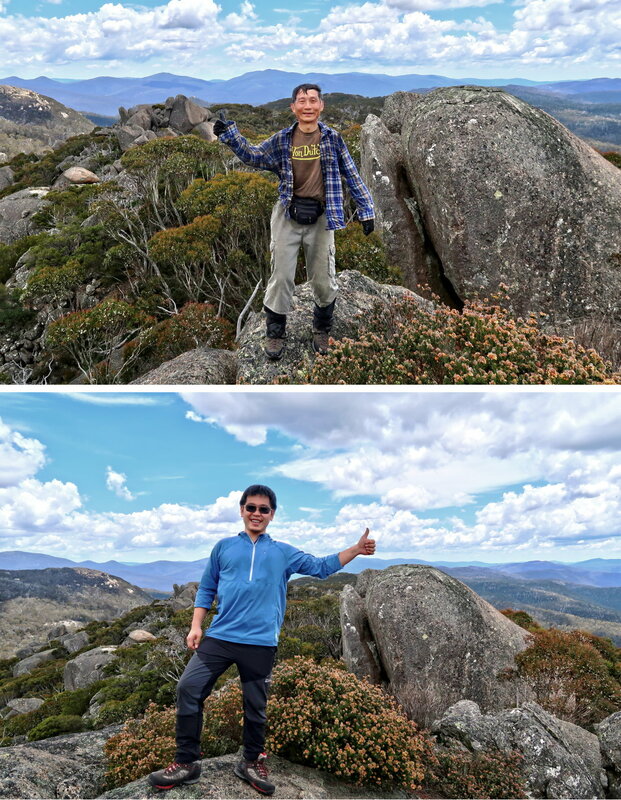 - After reaching Mt Mavis summit, retrace our steps back to Nursery Swamp Carpark. Park our cars at Nursery Swamp Carpark. 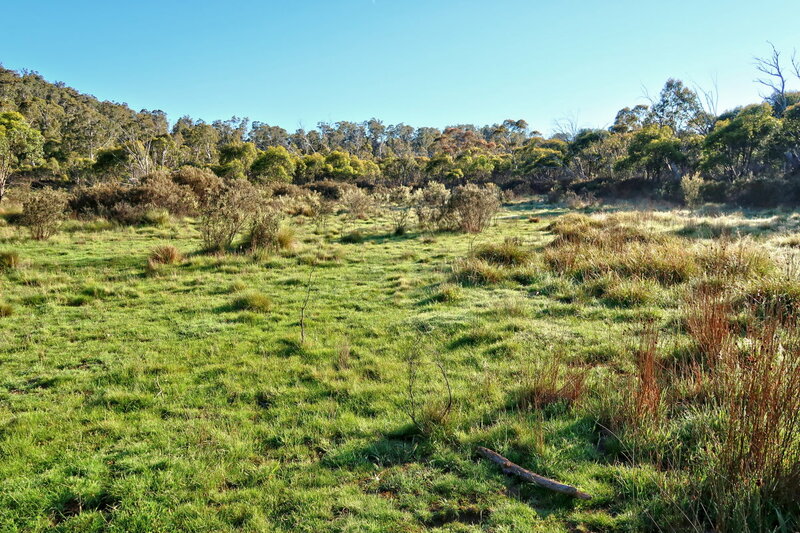 06:18 0.0 km Start walking on Nursery Swamp Walking Track. 06:59 2.5 km Stop to check our position. 07:03 2.55km Resume walking ... go off-track scrub bashing towards Mt Mavis. 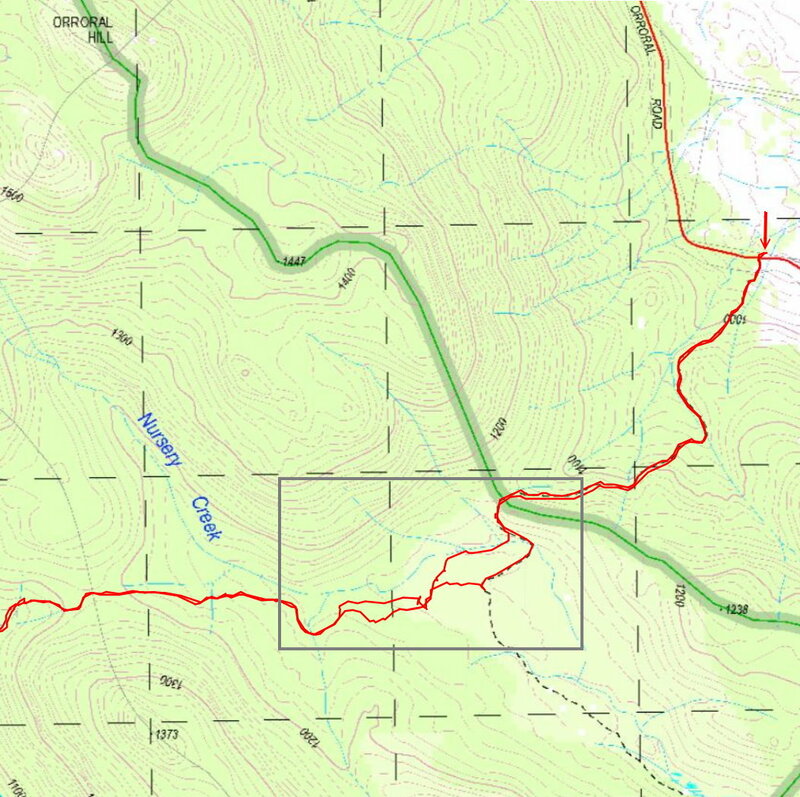 08:10 5.25km Cross Rendezvous Creek. 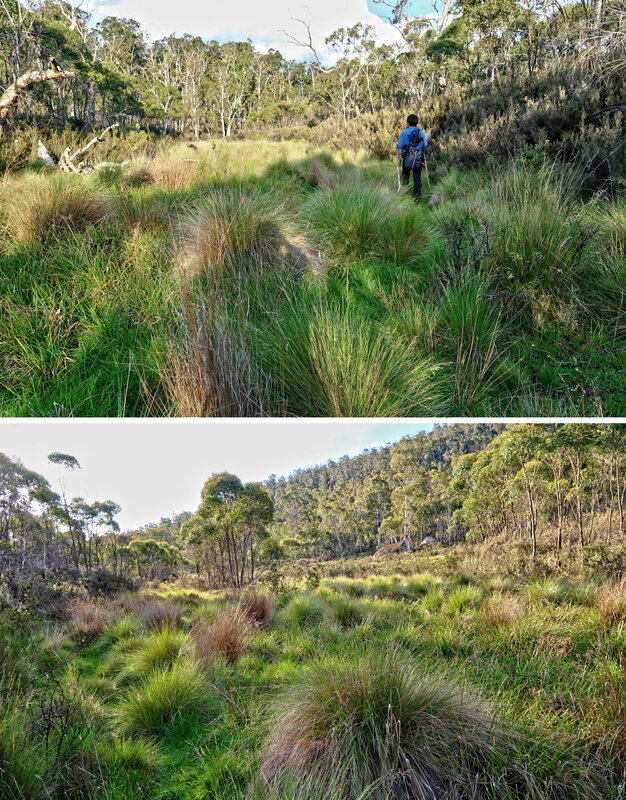 Foot track ends at Rendezvous Creek, and so, scrub bashing again. 08:20 5.5 km Stop for rest. 09:56 7.4 km Stop for Morning Tea. 11:04 8.1 km Stop for rest. 11:13 8.2 km Resume walking. 12:03 8.65km Stop for rest. 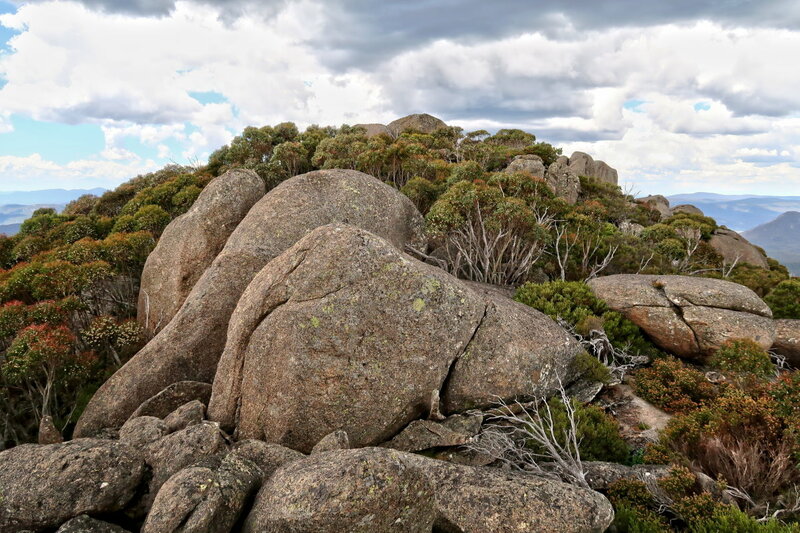 12:24 8.75km At top of a pile of boulders north-west of Mt Mavis summit. 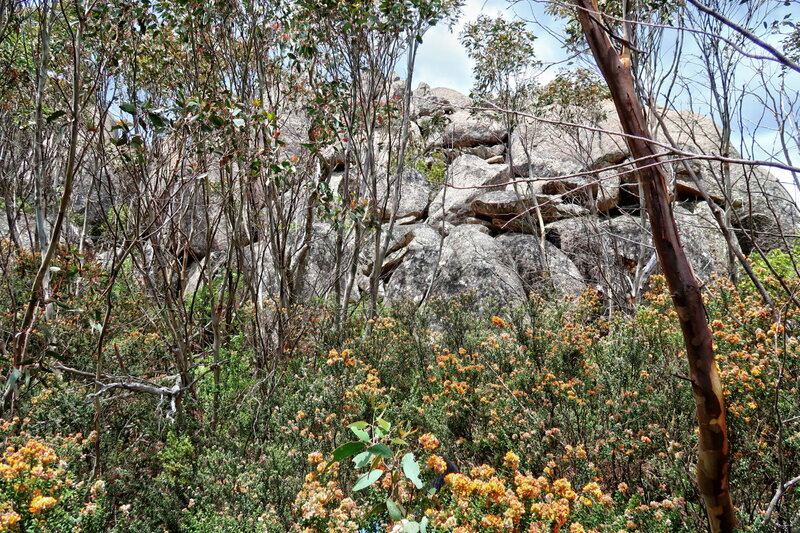 12:30 8.75km Leave top of a pile of boulders and head for Mt Mavis summit. 12:47 8.9 km At Mt Mavis summit. 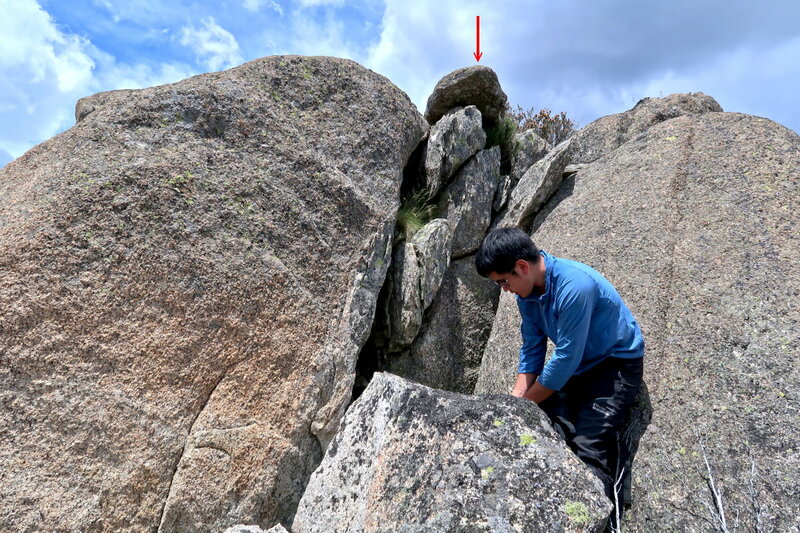 13:30 9.0 km Attempt to find a way to climb up a large boulder which maybe higher than the summit. 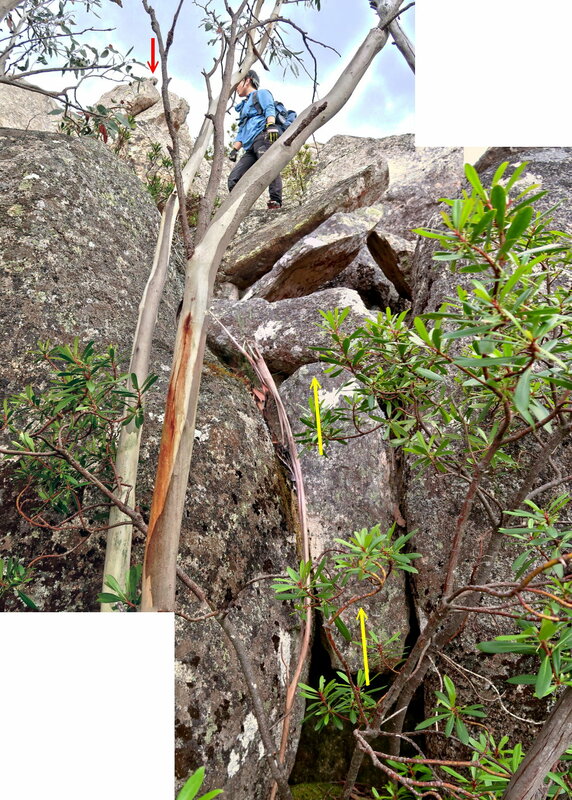 13:40 9.1 km Start descending Mt Mavis after failing to climb up the boulder. 14:22 9.55km Stop for rest and change GPS battery. 14:36 9.6 km Resume walking. 15:23 10.35km Stop to change GPS battery again. 15:30 10.4 km Resume walking. 17:19 12.55km Stop for rest (close to Rendezvous Creek). 17:28 12.6 km Resume walking. 17:30 12.7 km Stop at Rendezvous Creek to fill up water bottle. 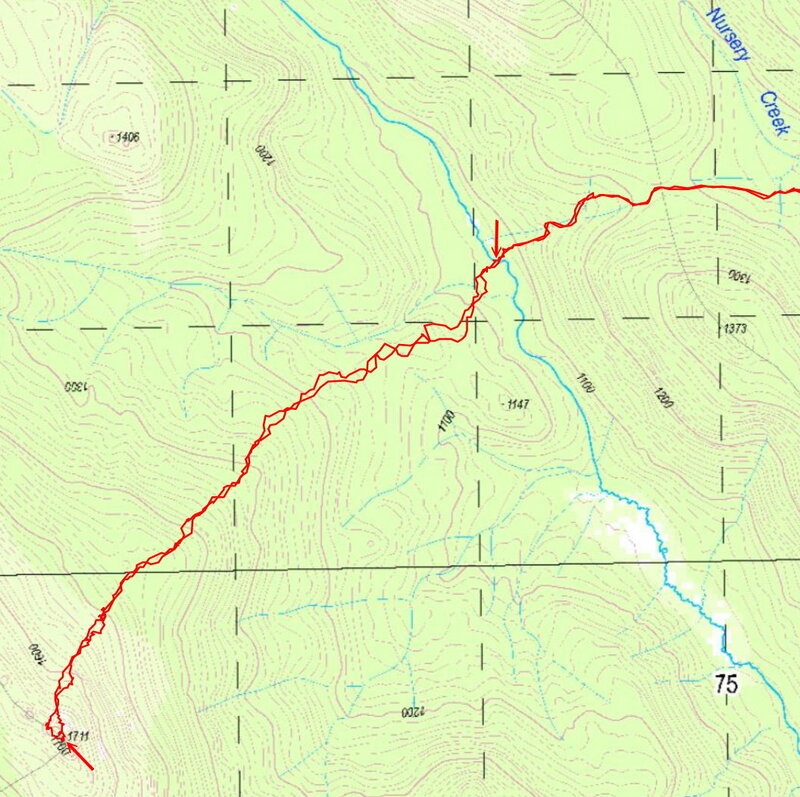 17:34 12.7 km Cross Rendezvous Creek. 18:46 15.4 km Same spot as at 07:11 ... We decide to walk along edge of a swampy area on south side of Nursery Crk. 19:00 15.85km Meet up with Nursery Swamp Walking Track. 19:31 17.85km Back at Nursery Swamp Carpark. It is a hot day - 37 degrees in Canberra, cooler in the mountains. I took 4 litres of water. That turns out to be not sufficient. I end up drinking 5 litres of water. The other litre is from Rendezvous Creek, on the way back to the car. 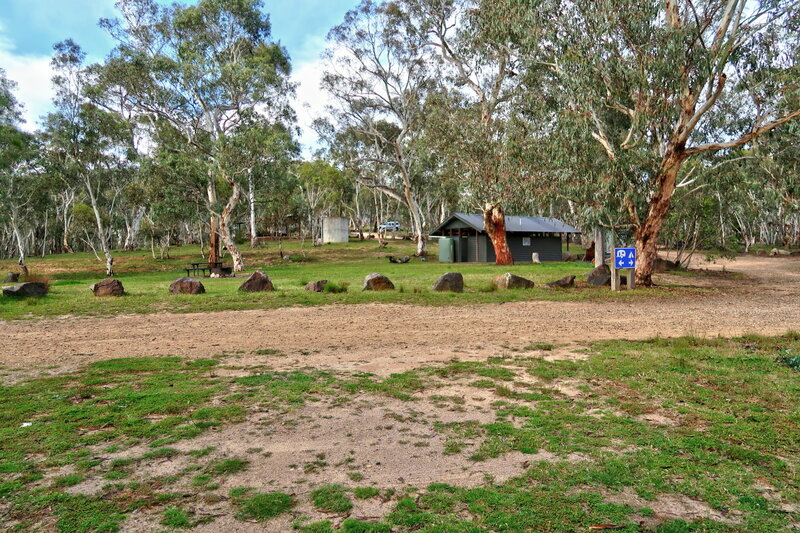 1) The night before, I camped at Orroral Campground (Orroral Road, Rendezvous Creek, ACT 2620). It is a nice campground. The building you can see here is the toilet block. 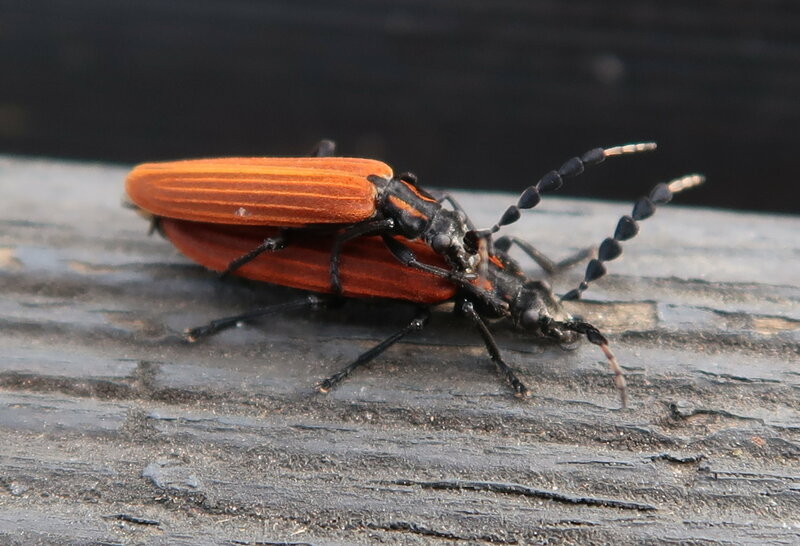 Please let me know their name. They were like this all the time ... and walking around too, not standing still ! 3) Early morning the next day, we park our cars at Nursery Swamp Carpark by the side of Orroral Road, about 3km north-west of Orroral Campground. It is a small carpark. My car is on the left. Neilson's car is on the right. 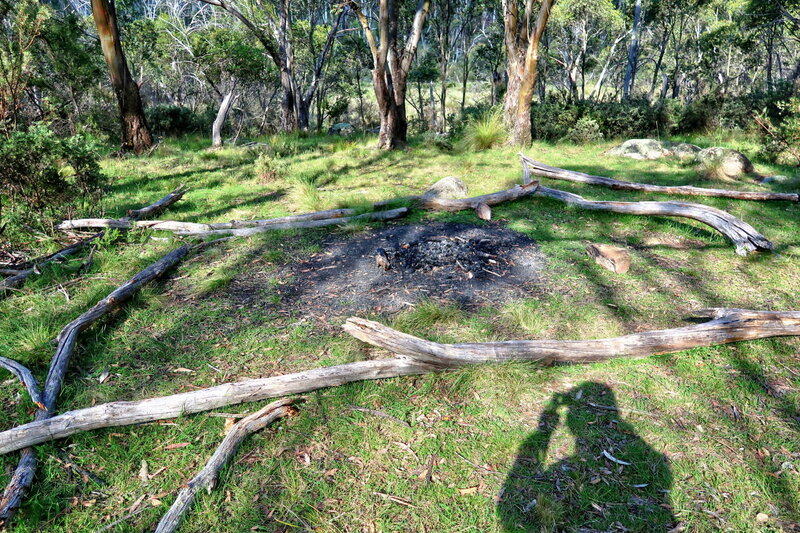 4) The trailhead to Mt Mavis is across Orroral Road, just opposite the carpark. 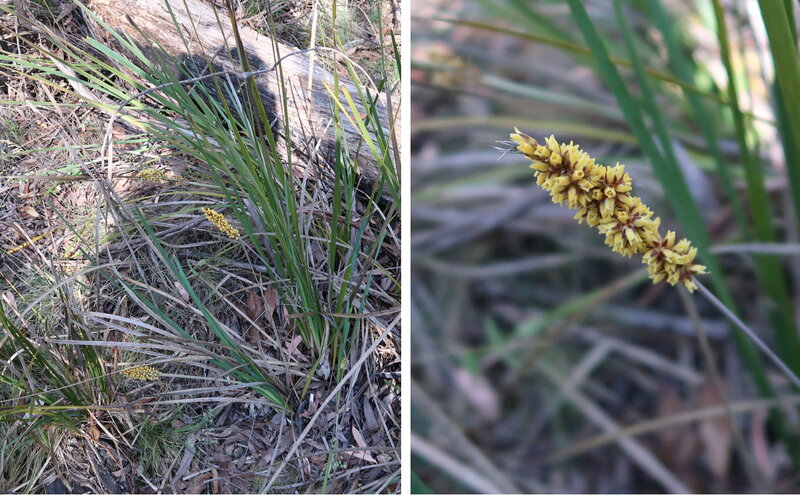 - Yellow arrow: We'll walk on the Nursery Swamp Walking Track, but not all the way to Nursery Swamp. 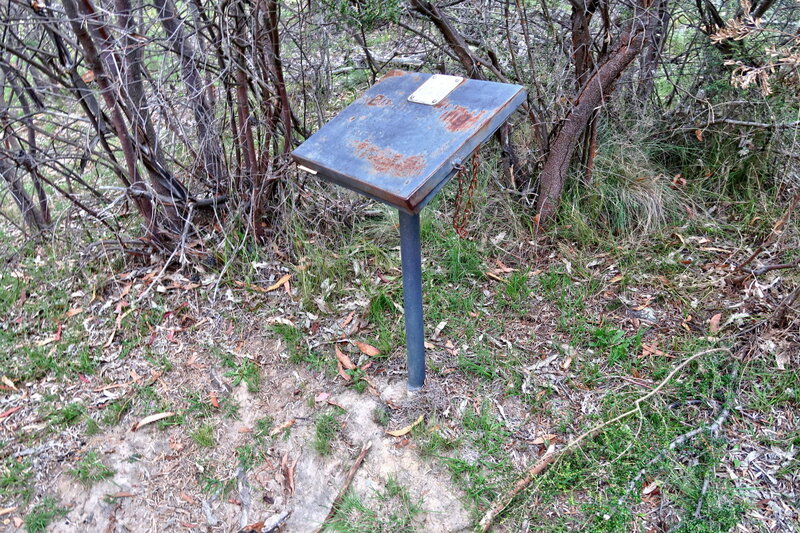 5) A few paces into the Nursery Swamp Walking Track is a metal box. 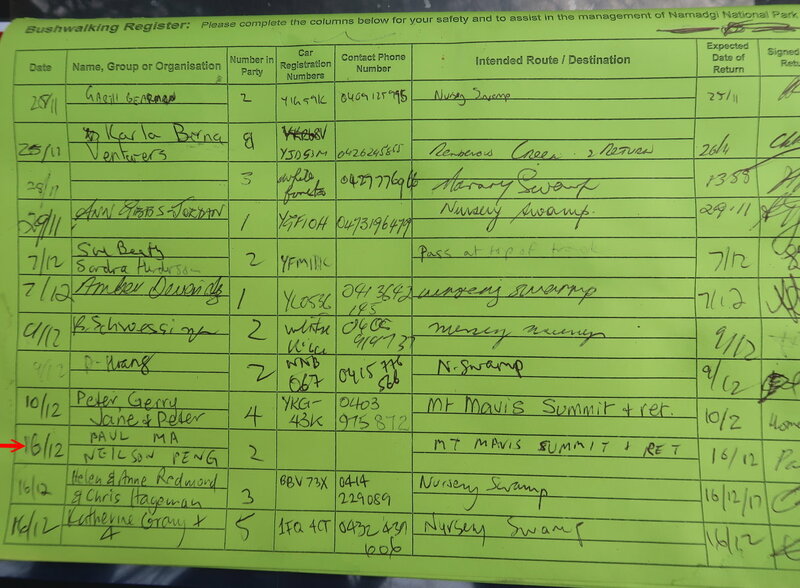 Inside is a log book for hikers to register their walks. Neilson is checking our GPS position on his phone. He is saying that I've gone too far. 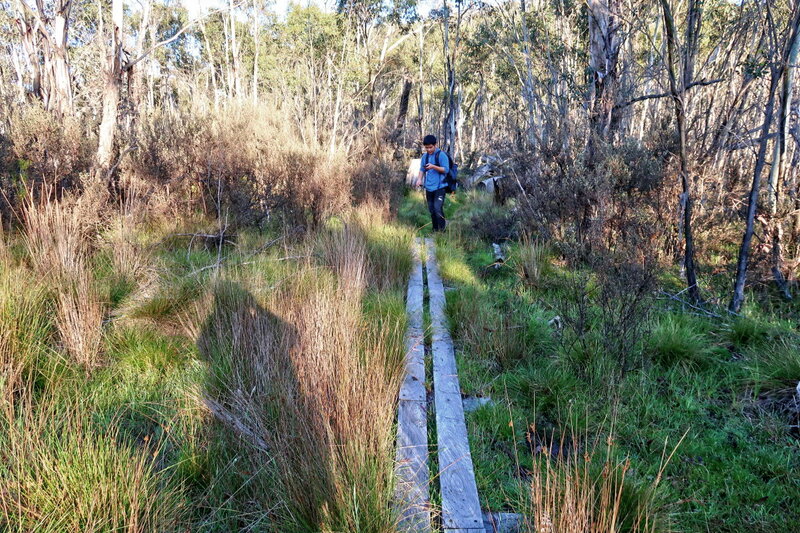 At where he is standing, we should go off track towards Mt Mavis. He is right. 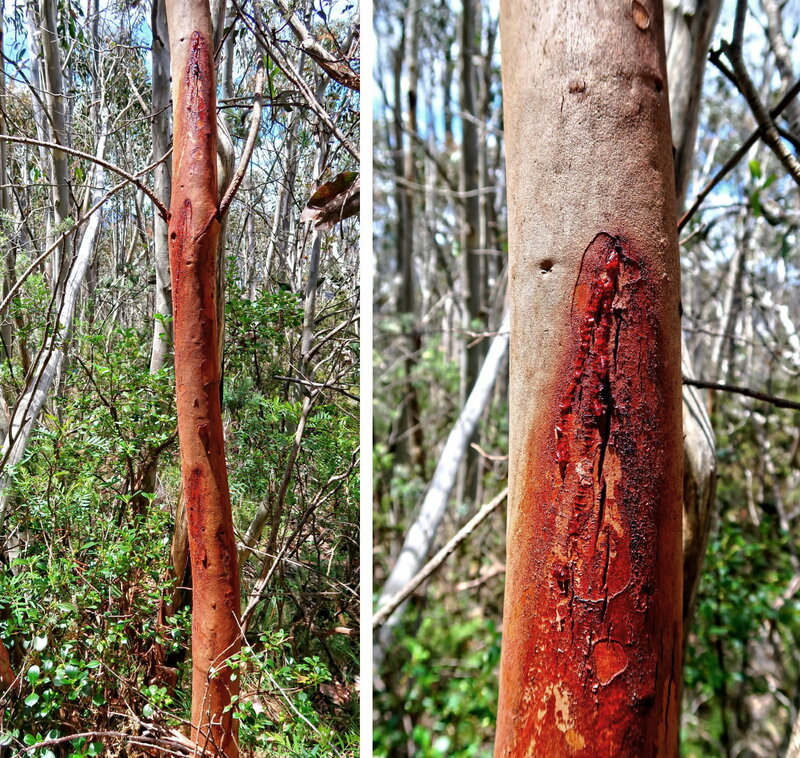 8) So, we've gone off-track, not enjoying the bushbashing. 9) Then we come to a swampy area of Nursery Creek. It hasn't rained for a while, hence we can walking across it without getting our boots wet. Time now is 7:11am. Here, if we now keep going straight (towards west), we could have meet up with a foot track. 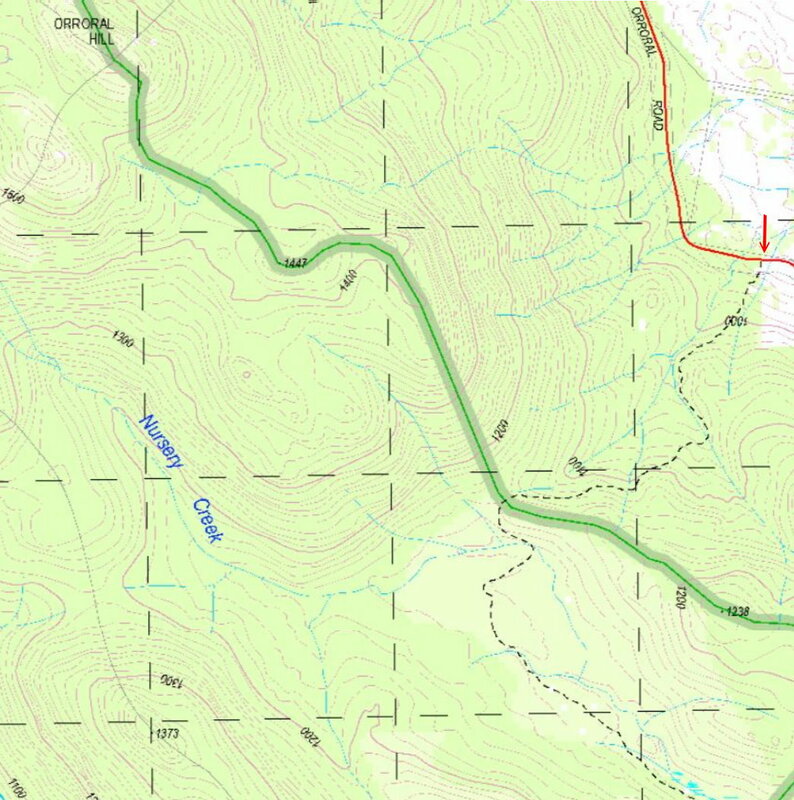 Instead we veer south and end up doing some unnecessary bushbashing :-( ... Scroll back to see Map #5. 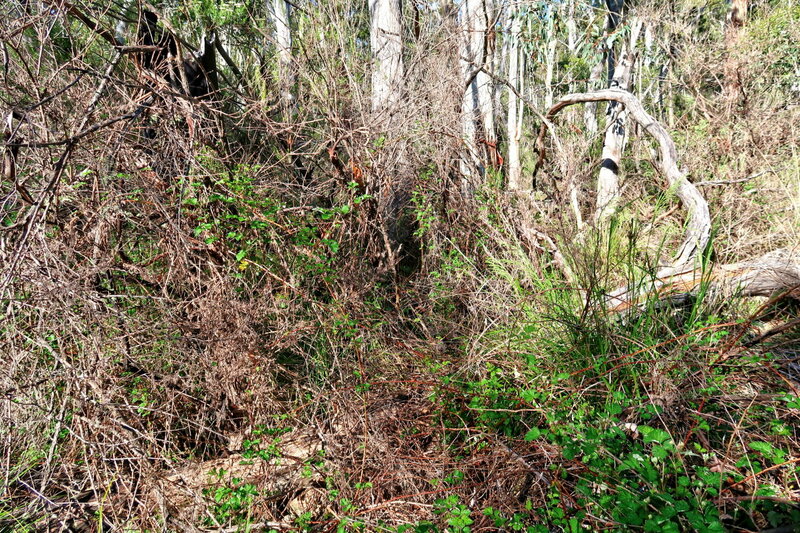 10) After some unnecessary bushbashing, we encounter a foot track. I wonder who would want to create this track? It leads to Rendezvous Creek ... but hardly anyone goes there ! 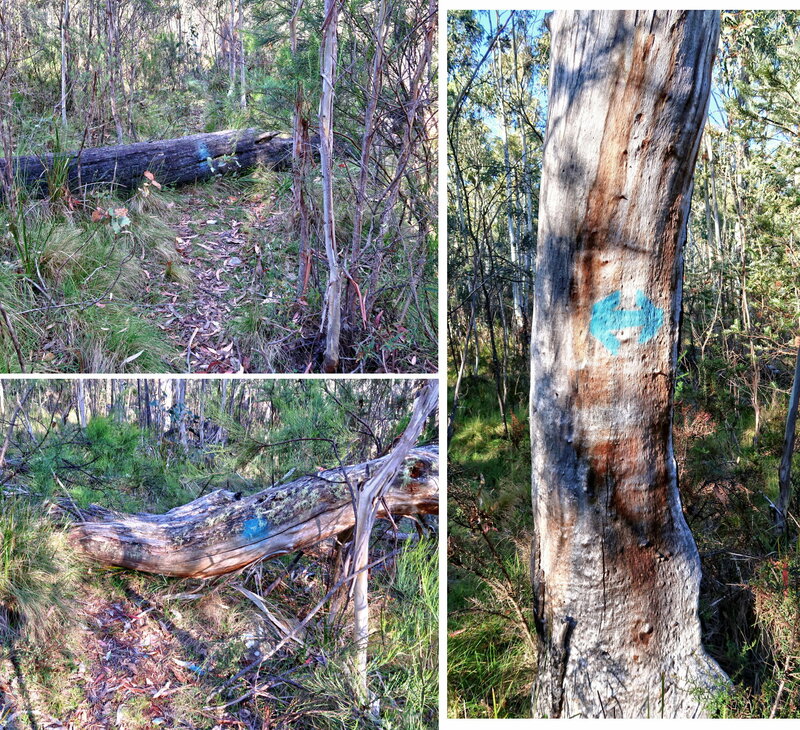 Furthermore, someone had sprayed some tree trunks with blue paint to show the way. Was the blue paint meant for an event held sometime ago? 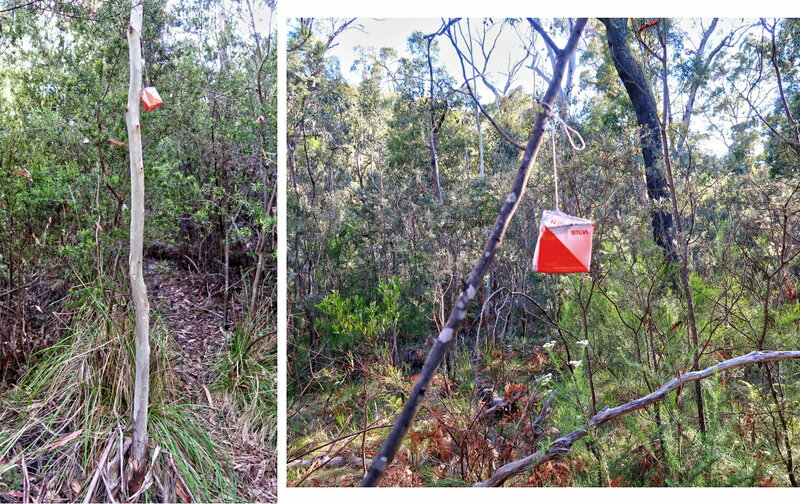 11) There are also these packets hanging on tree branches. Was there a race or orienteering event held here ??? 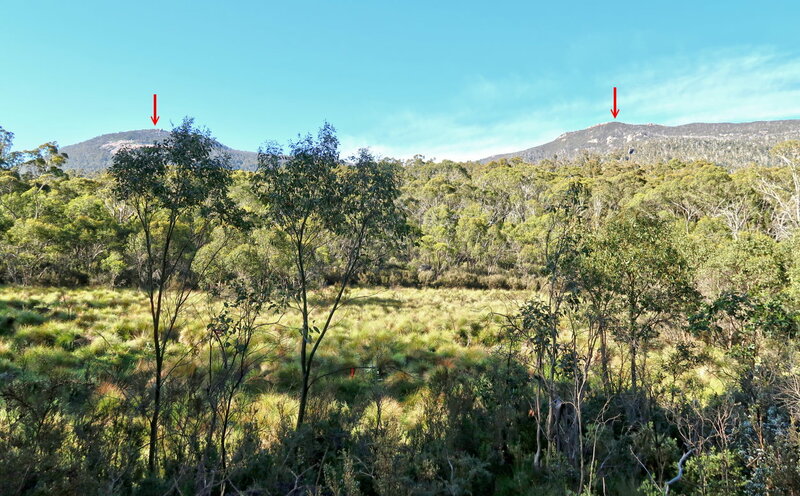 At last, we can see Mt Herlt 1615 meters (left red arrow) and Mt Mavis 1711 meters (right red arrow) ... we couldn't see them earlier. 14) It is a swampy area along Rendezvous Creek. The swamp is quite dry when we cross it. 15) Shortly after crossing Rendezvous Creek is this nice camp site. 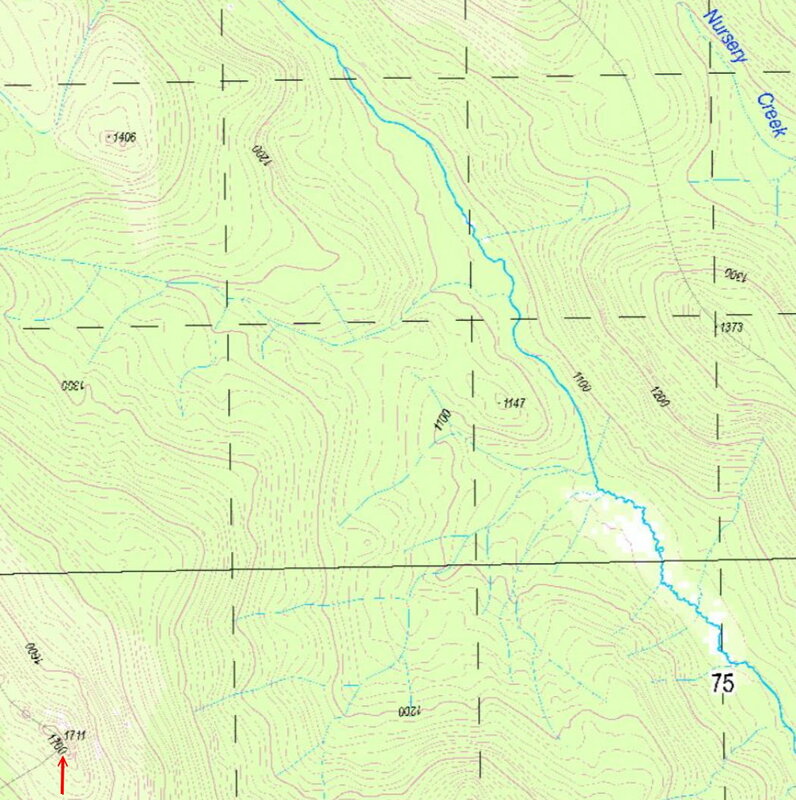 16) The foot track ends at Rendezvous Creek. 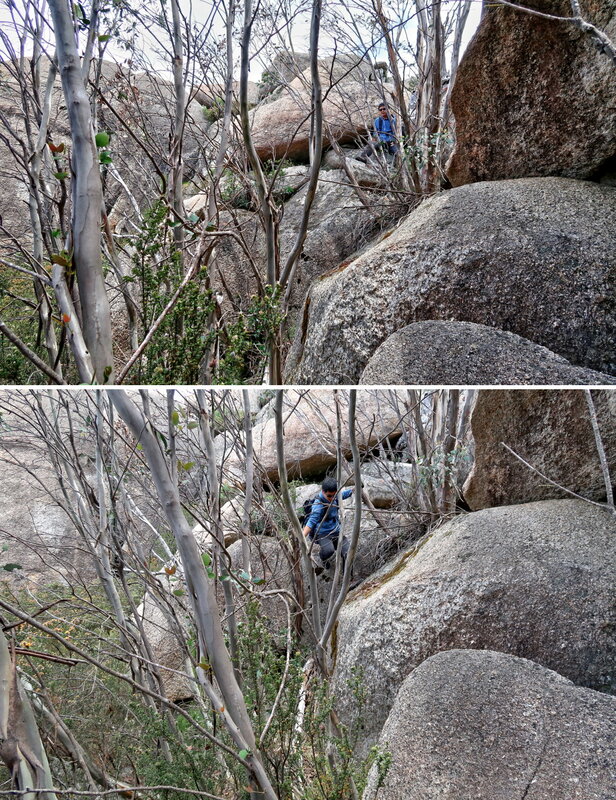 After crossing the creek and the swamp, the serious climbing starts, and it is bushbashing ... not pleasant. 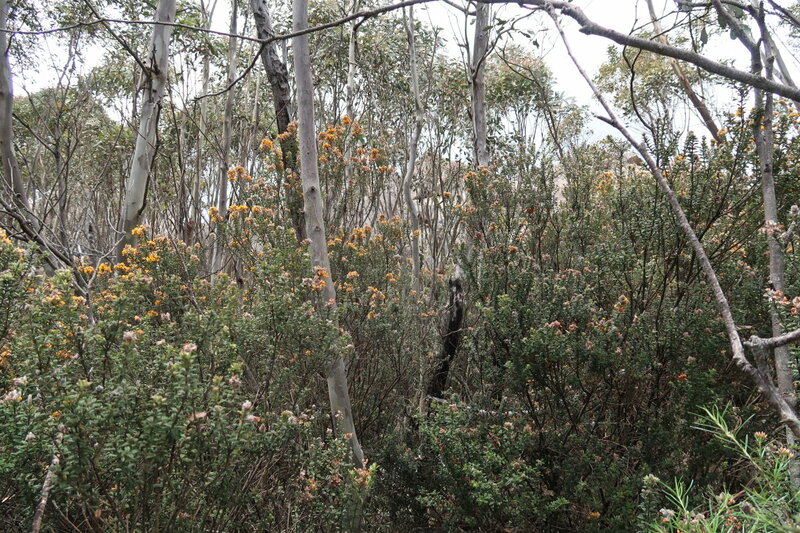 17) Despite the pretty yellow flowers, this type of bush is difficult to bash through. 20) If you know the name of this flower, please let me know. 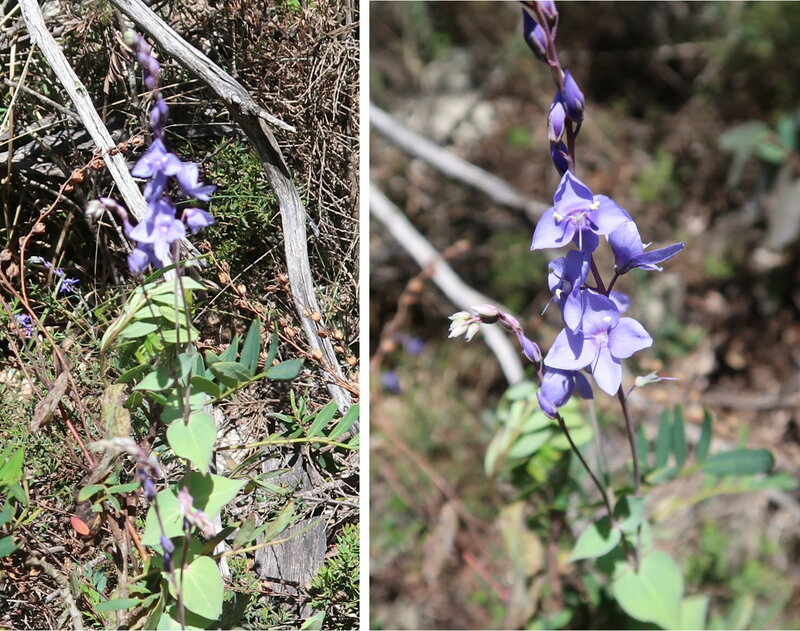 21) If you know the name of this blue flower, please let me know. 22) If you know the name of this flower, please let me know. 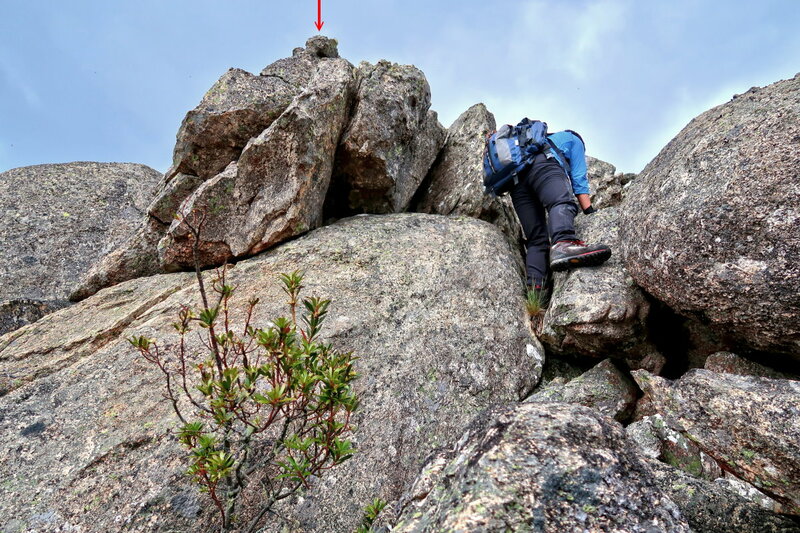 25) We reach a pile of boulders ... We thought the top of which is the summit. - Red arrow: The top is there. We've climbed to the top of the pile of boulders. - Ginger Ale is blocked by the boulders at the centre of this pic. 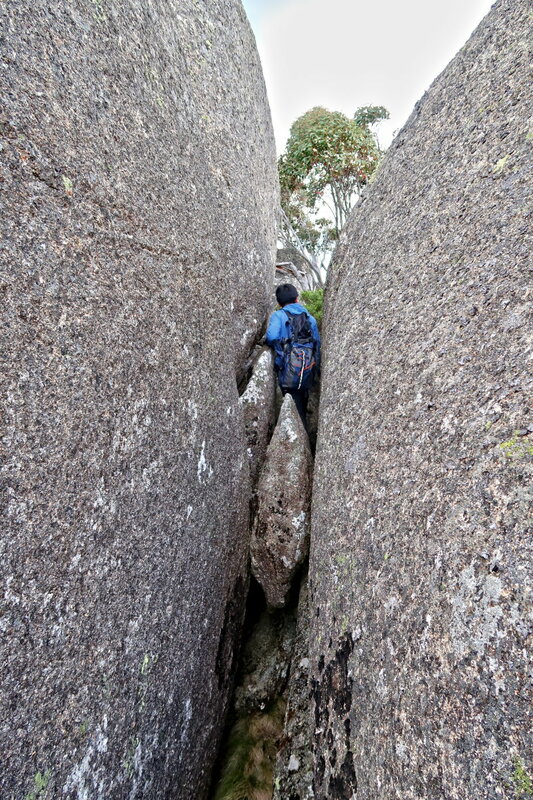 32) We are on our way to the summit of Mt Mavis ... passing through a gap between the boulders. 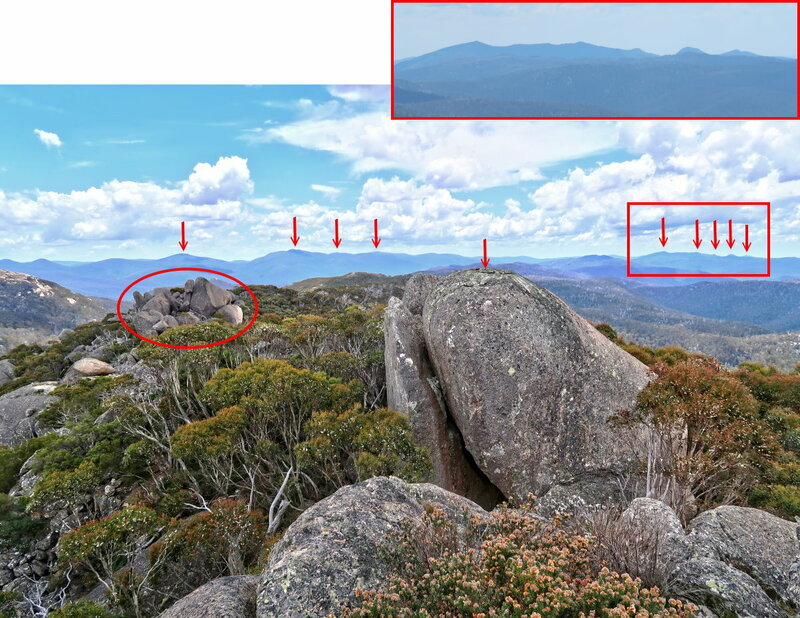 33) We can see it ... the summit of Mt Mavis. 35) The final climb ... it is steep, but there is enough hand-holds to haul yourself up. 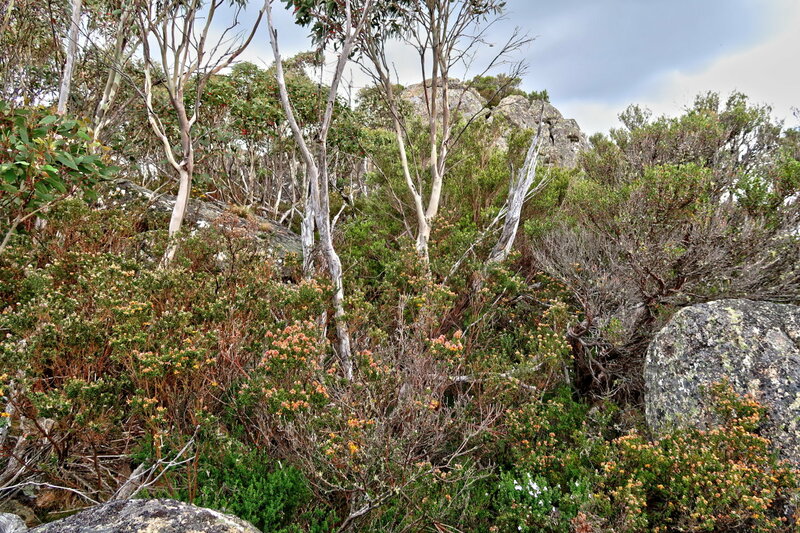 36) We are at the summit of Mt Mavis ... sort of ... see photo #37. 37) This pic and photo #38 form a 360-degree panorama. 10 Pierce Hill ... The only peak in this list that I haven't climbed. - Red oval: The pile of boulders here is the same as the one in photo #29. 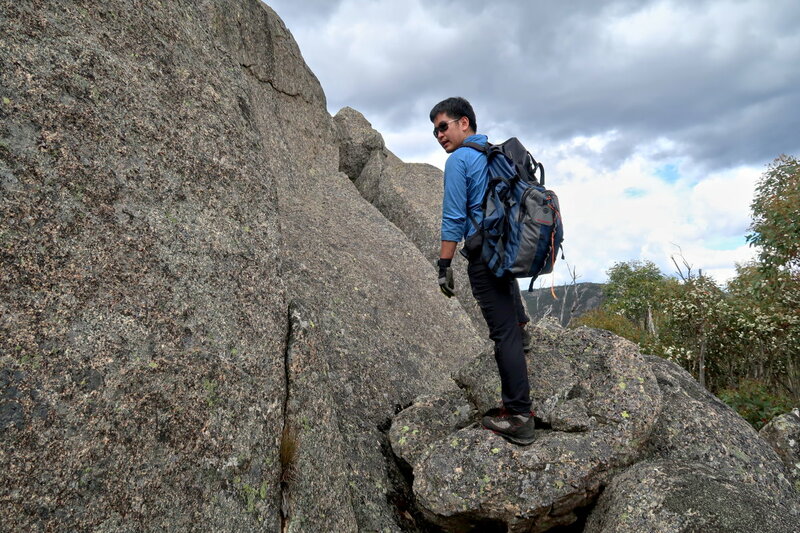 - I can't figure out where in this pic is the pile of boulders we climbed in photos #28. It should be in front of the red oval, and should form a straight line to the oval and to Ginger Ale. But where is the pile of boulders ??? • Photo #39 zooms into the right half of this pic. 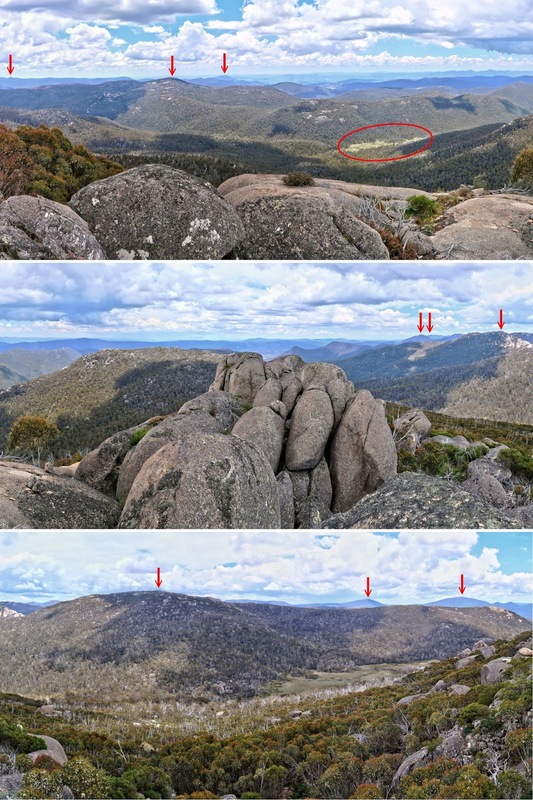 • The long flat area below and to the right of Mt Namadgi is Big Creamy Flats. 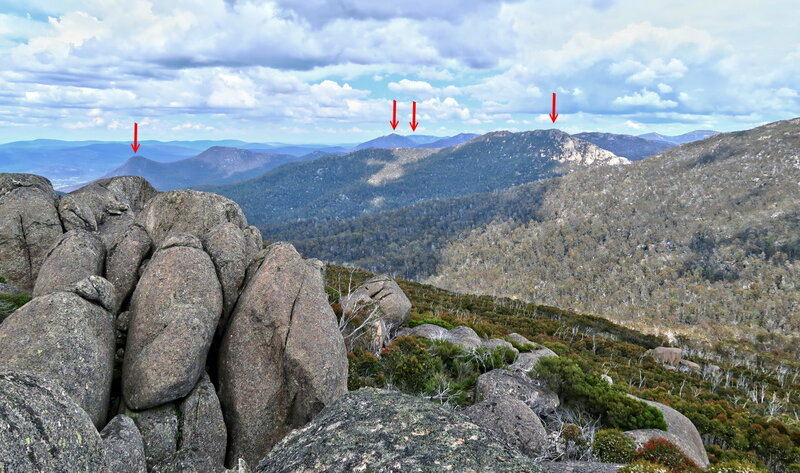 • Mt Kelly & Mt Scabby are blocked by Mt Namadgi, hence can't be seen from here. - Continuation to the right of the lower pic is photo #37, thus completing a 360-degree panorama. 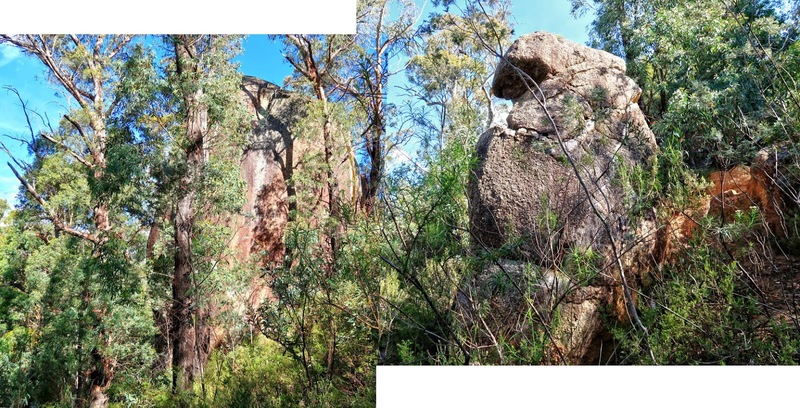 39) Of particular interest to me is the right half of the middle pic of photo #38 ... because three weeks ago, I climbed Mt Gudgenby. 41) We've retraced our steps down Mt Mavis slope, crossed Rendezvous Creek, and are now at a swampy area of Nursery Creek. This pic is taken not too far from photo #9. 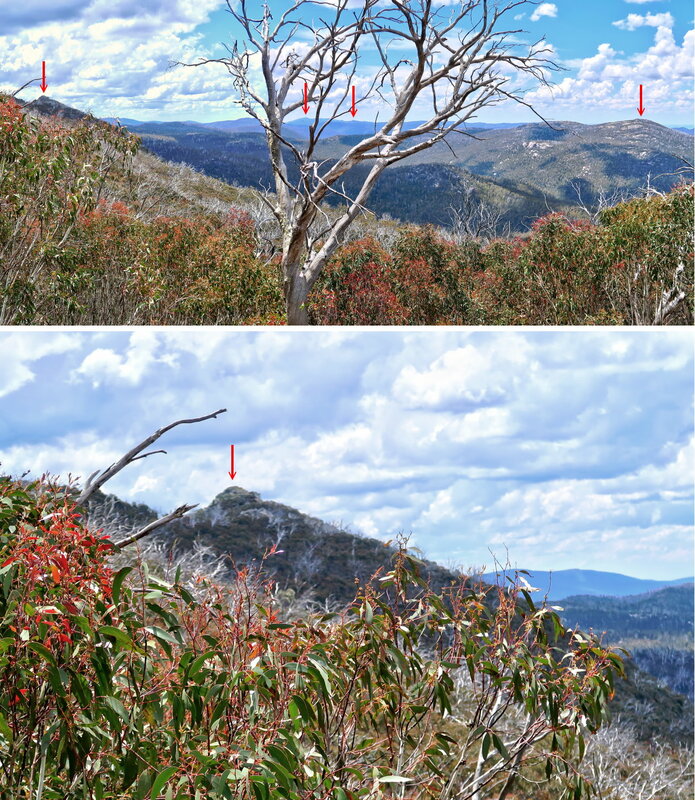 In fact, you can match some features of the hill on the left side of this pic with that of photo #9. 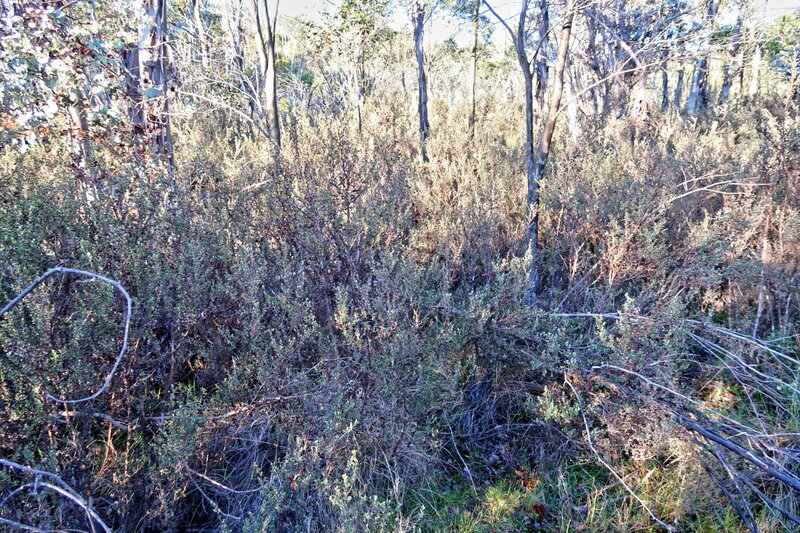 43) About 150 meters further along Nursery Creek, we come to this small fenced off area on the edge of the swampy area. 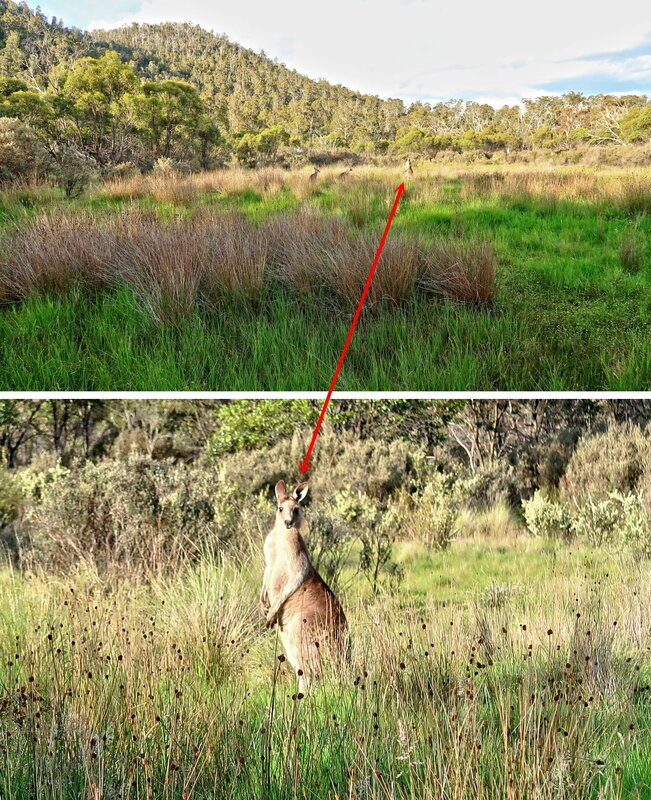 One side of the enclosure has a small gate (red circle). 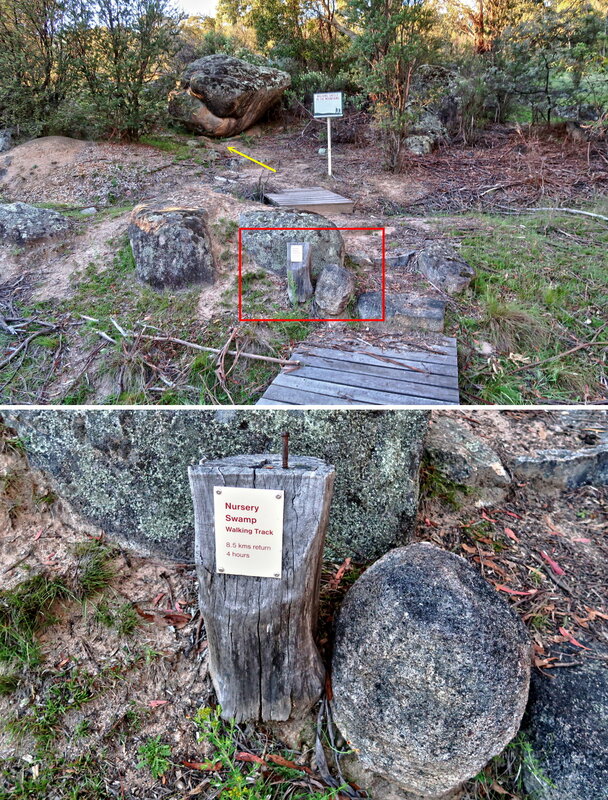 In the Comment Section, Teddy Wombat said it is a feral pig trap ... thanks Teddy Wombat ! 44) After we reached the swampy area of Nursery Creek (photo #41), we decided to walk along the edge of the swamp instead of trying to find the foot track. 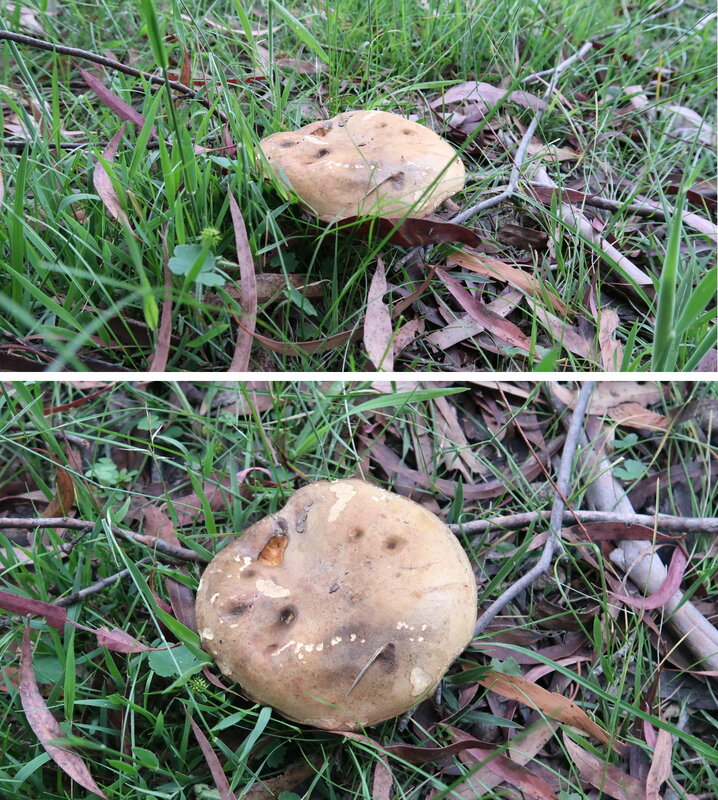 There hasn't been much rain for a while and it is quite dry, easy to walk on. 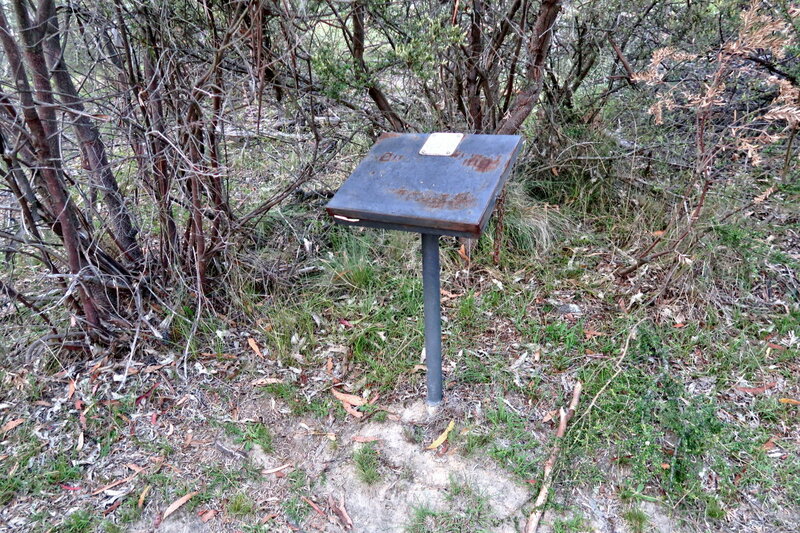 45) Back at the trail head of today's walk ... at the metal box containing a log book for hikers to register their walks. See also photo #5. 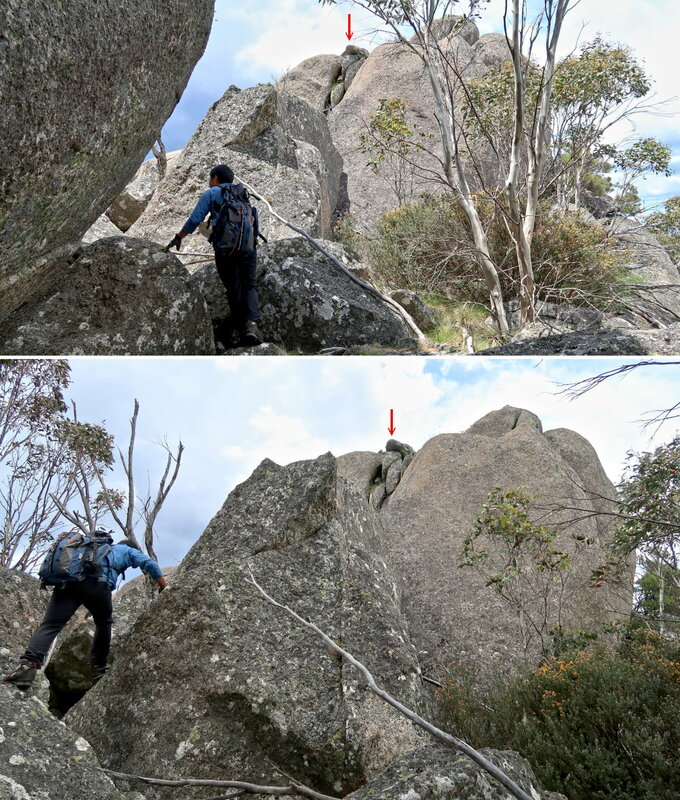 - Not many people climb Mt Mavis. In this page, besides us, only one other group went there. 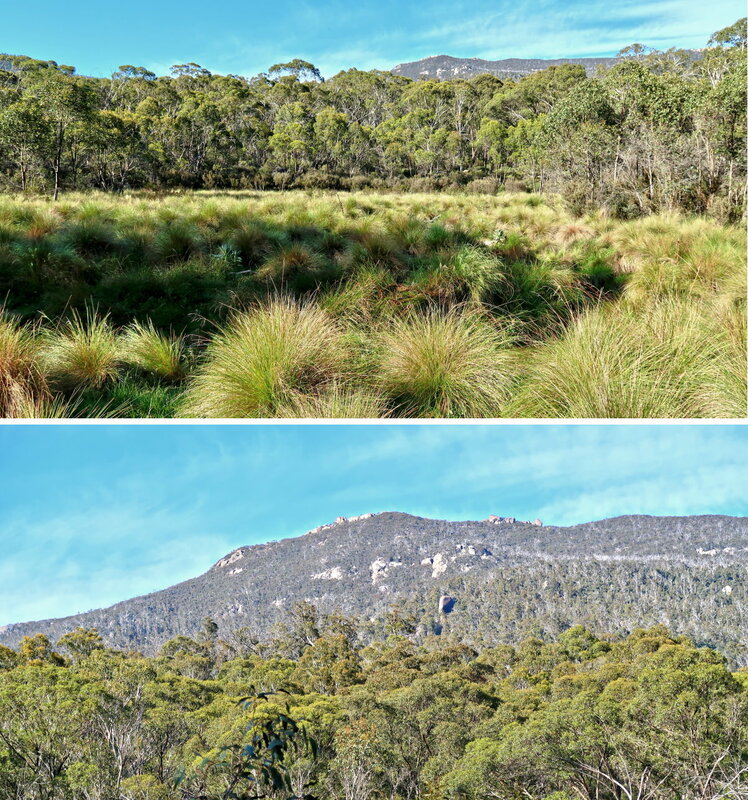 - The Canberra Bushwalking Club is supposed to climb Mt Mavis 2 days earlier, on 14 Dec, led by Jonathan Miller. Strange ... why didn't they log their entry here ??? 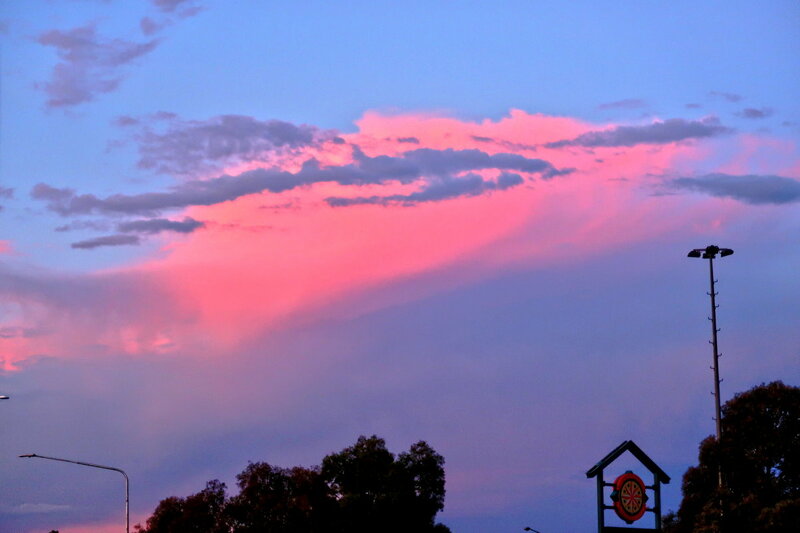 48) Back in Canberra, in the suburb of Condor, I notice the setting sun lights up these clouds in a beautiful pink colour. Whilst pink clouds at sunset is common, this one is unusual in that the clouds are towards north-east and the sun is setting on the west. Thanks! 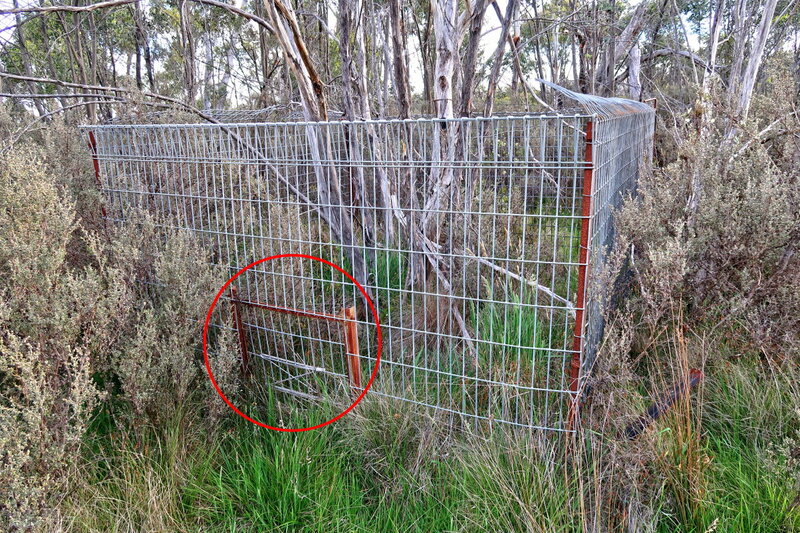 I have updated the blog to say it is a feral pig trap.